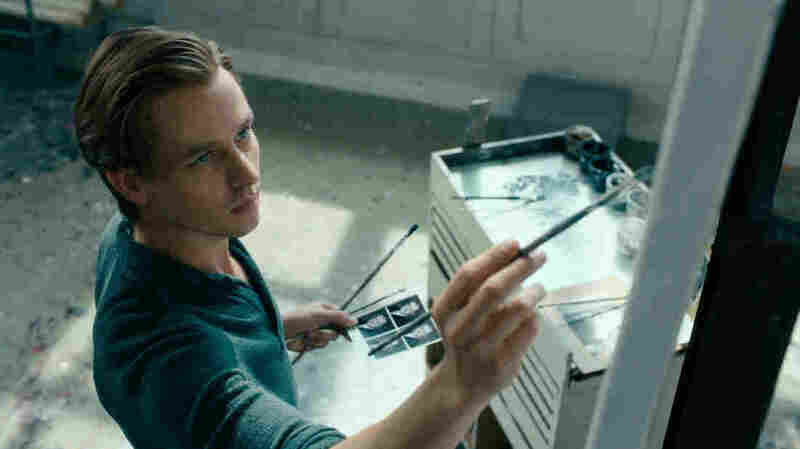 Review: In Drama 'Never Look Away,' A Painter Mixes Art And Autobiography Tom Schilling plays a German painter clearly modeled on Gerhard Richter in this melodrama about the lingering costs of war and the ways they inform both art and artist. Tom Schiller plays artist Kurt Barnert, a character modeled on Gerhard Richter, in this old-fashioned melodrama from writer-director Florian Henckel von Donnersmarck. As an old-fashioned melodrama about a modernist artist, Never Look Away is philosophically vexing. But it's a good story well-told, and never grows tiresome despite its three-hour running time. Writer-director Florian Henckel von Donnersmarck, returning to the terrain of his Oscar-winning 2006 The Lives of Others, again proves himself glib in both good and bad ways. The central character is Kurt Barnert (Tom Schilling), clearly modeled on Gerhard Richter, whose work now draws some of the highest bids at international auction houses. The filmmaker gives his character an alias not because this is an unflattering portrait — it could be much harsher — but to free himself to construct narrative parallels that are far too tidy for a historically scrupulous account. The theme is the nexus between art and politics, so the film must begin where it does: at a Nazi-organized exhibition of "degenerate art." It's 1937, and little Kurt is there with his teenage aunt, Elisabeth (Saskia Rosendahl). "Don't tell anybody, but I like it," she whispers to him about a Kandinsky. Elisabeth is beautiful and high-spirited, and Kurt adores her. So does the movie, which takes its English title from one of her nuggets of aesthetic advice to the boy. But she's not entirely sane, and finds herself in the clutches of a Nazi program to eliminate people deemed genetically unsuitable. The man who determines her fate is Carl Seeband (The Lives of Others star Sebastian Koch), an imperious Dresden gynecologist. He's an enthusiastic Nazi who feels fully entitled to judge which women should be allowed to breed, and under what circumstances. That becomes a central issue after the war ends in a slick flurry of cross-cut devastation. Kurt's father, who was forced to join the Nazi Party, can't find work in Marxist East Germany. But Seeband, imprisoned by the Soviets, wins his freedom by saving the baby of a Russian officer. Soon the doctor is as good a Communist as he was a Nazi. Now a teenager, Kurt works as a sign painter and gets a shot at art school; his commercial-art background helps him excel as a socialist-realist painter. More importantly, Kurt meets a lovely fashion-design student (Paula Beer). She's named Elisabeth, of course, although Kurt negotiates a nickname, Ellie, in deference to his lost aunt. Too bad Ellie's surname is Seeband. In the third hour, Seeband and his wife flee to the West, followed by Kurt and Ellie, who are now married. The young couple struggles financially, but Kurt's biggest challenge is finding a new artistic mode. He's assisted in this by an outlandish artist-professor (Oliver Masucci), who's as much Joseph Beuys as Kurt is Gerhard Richter. Beautifully shot by Caleb Deschanel, Never Look Away conveys both the sweep of history and a grim sense that change is not transformation. The world around Kurt is far more interesting than his character, while Seeband embodies the raw self-interest that survives both physical cataclysms and intellectual upheavals. This is the sort of movie where dialogue and events are neatly reprised, more just for the fun of it than to make a point. Von Donnersmarck is drawn to stories of Nazi- and Communist-brutalized Germany, but he's no documentarian. He depicts moments of incomprehensible savagery as if they were the just the ticks and tocks of a clockwork universe.